Escapism at its absolute tardiest. I have seen good movies, and I have seen bad movies, and I knew when to call the former and ladder good and bad. But frankly, I don't know what to call this anti-matter of motion pictures, because this movie is absolutely horrible. The way this movie turned out is unacceptable. The acting is sloppy, the tone and pace are nonexistent, the direction is mind-bogglingly bad and the screenplay is the worst part. I wasn't a big fan of No Country for Old Men and I heard All The Pretty Horses wasn't exactly good, so I don't look upon Cormac McCarthy very positively. Apparently, this was his first screenplay, and he has not a shred of sense or style to show for his work. He wrote every single scene as if it were a novel, and that made it some of the most confusing human interaction I have ever witnessed on camera. These conversations are so random and never get to the point that they become stupid. Leave me a comment if you can tell me what any of these characters was talking about at any point in this movie, because one half of it is just incoherent rambling and the other is wanna-be poetry. It's infuriating how they talk. Brad Pitt is horribly miscast in a role so macho and blatant, it will remind you of his high character Floyd from True Romance. Why was he laughing every five seconds?! Why did anyone do what they did in the film?! Cameron Diaz is Razzie-worthy in the film, I've never said that about anyone, but she was simply maddening. Let me sum it up bluntly: If you filmed a movie without a script, only about five characters played by the same actors, it would be exactly the same as the actual Counselor. THAT is how nonsensical it is. What was this movie even about? Why did people do these infuriating and stupid things? Ridley Scott must have watched No Country for Old Men once too often, but because it is of course a McCarthy script, he must have found it necessary to kill main characters right and left and put Michael Fassbender in a position where he wasn't even able to give a good performance. How, Scott? How do you f*ck it up this badly? How could you not at any point think: 'This might not work' or 'This might not be suspenseful or funny'? How do you remain blind to the fact that what you have filmed doesn't even make sense or offer the viewer something worth watching? Why can't Ridley Scott make good movies again? Why can't he choose a somewhat logical script? There is not a single thing I liked about this film. 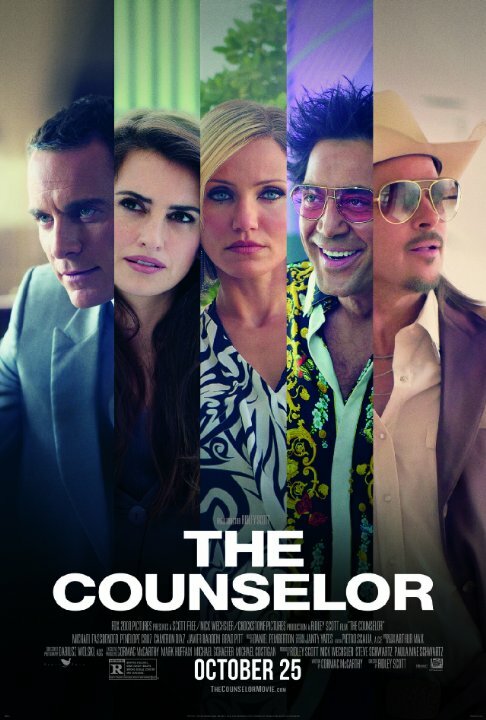 The Counselor is not only disappointing, but insultingly self-important and stupid. A great cast goes to waste, the plot is basically made up as they go along, the direction is awful to a degree where you ask yourself if Scott has gone completely mad and honestly, you could look at the come-stain on one of the car windshields in this movie for two hours and seventeen minutes and it would have been more interesting, entertaining and logical than any other moment of this stuck-up and pretentious disgrace of a film.